Jem Roberts loves Douglas Adams. 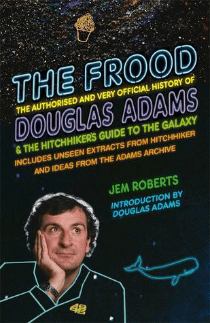 The Frood combines new information with an encyclopedic knowledge of Adams’ life and work. It is as complete a biography as ever has been written about the late author who died of a heart attack in 2001 at the age of 49. Roberts explores never before seen material donated by Adams’ daughter to Cambridge University as well as retelling tales declared as “famously known.” To describe a non-fiction work as “joyful” may seem trite but if any biography of any person was ever a love letter, The Frood fits that description perfectly. I am slightly uncomfortable with Adams as the eponymous “Frood.” I know that the nickname is a callback to the author’s most famous series and that the word is listed in the online English dictionary as “someone who really knows the location of his towel” and Adams would have certainly been that man. Even so, the descriptor comes off as too cute in the context of the work. The author highlights that subsequent projects have come as a result of love of the man tells this reader that there are those that will relish the unusual familiarity with the subject in the work. Certainly, Roberts must feel a true kinship with the late author having spent so much time on the page with him. The Frood is the treasure trove of the serious fan. The new information, the Easter Eggs in the piece will delight, though the repeat report of false information might annoy the more serious fan. As a Whovian, I found some of the statements of fact in the parts dealing with Adams’ work on Doctor Who to be bold claims that upon further research would likely prove to be not entirely true. In a biography, truth and integrity are King and perhaps those claims robbed the piece slightly of some of its credibility. For more information about Jem Roberts visit his website. You can connect with him on Goodreads, Facebook and Twitter @JemRobert.